Showcase #32 (May 1961) - The Creature King of the Sea! Aquaman and Aqualad inadvertently assist a criminal to turn into a dangerous creature that steals gold. Aqua-Exclamations: Great Sea Horses! Suffering Starfish! Great Guppies! Leaping Lizardfish! Suffering Swordfish! Great Waves! Suffering Sardines! Captured/Knocked Out report: The creature traps a whale in the smokestack funnel of a wrecked ship, and the pair are captured when they go to help it. Quotefile: Jed, during the rescue, "Imagine... me at the ocean bottom, breathing fresh air!" Finny Friends Report: A giant devil ray brings a pocket of air from the surface to the trapped diver. 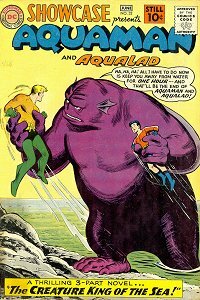 Giant clams protect Aquaman and Aqualad from the barrage of coral. A lion fish and some hatchet fish cut the roots that attack the pair. A group of jellyfish attack the creature to allow Aquaman and Aqualad to escape. Pilot fish, lantern fish, and midshipman fish gather Aquaman's armies. Whale sharks attack first and are deflected by the creature. Swordfish try a sneak attack and are trapped in deck planks. Whales hold up the ship the creature attacks and take it back to port. A legion of octopi steal back the gold and place it on the backs of sea turtles who take it inland. A lantern fish lets Aquaman know the stealback is done. After the fish turns back into a human, fish follow him. Flying fish knock the gun out of his hand when he prepares to fire on the whales surrounding him. Sea gulls rescued Aquaman and Aqualad from the desert using blowfishes and sponges. Topo deflects the grenades, then wraps up the criminal until the Coast Guard arrives. Aqualad rides dolphins at the end of the story. I kind of like the set up of this one, in which Aquaman's urge to help backfires. On the other hand, the whole thing about the potions belonging to the guy looking for them is bunk. Aquaman should have been a little more cautious about the whole thing. Helping people is well and good, but he's a freaking super hero, he should at least check out the guy's story first!